Get ready for controversy: babies at weddings. Your friendships are about to be tested. If you’re prepared, you can minimize the damage. I refer, of course, to that timeless issue of whether or not to let your friends bring their babies to your North Carolina wedding. SCENARIO #1: The sweet little things alternate between cooing and napping during your ceremony. SCENARIO #2: The little monsters scream to high heaven throughout the wedding ceremony. You have to ask the officiant to repeat the vows a second and a third time before you can hear them over the din. All of this is captured by your wedding videographer. Forever. And we haven’t even gotten to the reception yet! Okay … scenario #1 is the likely outcome. Scenario #2 seldom happens, meaning infrequently or almost never. Here’s what to do: you know your friends with babies. Are they reasonable when it comes to their kids? 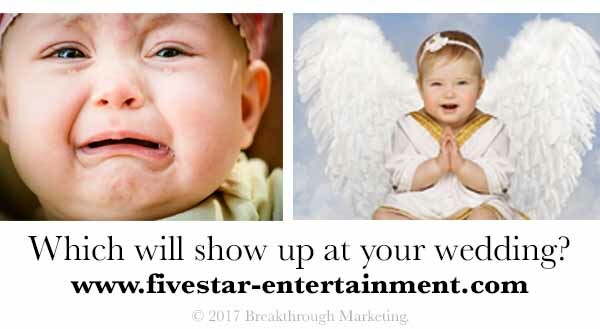 If their baby/infant/toddler gets fussy during the ceremony, will they discreetly step out to avoid disrupting your event? Or are they the type that believes the world revolves them, their needs, their convenience, and their kids, who by the way, can do no wrong? If you expect scenario #1, invite away, but if not, don’t. If in doubt, simply remember that this is your day, not theirs. Many brides and grooms love inviting families, complete with their kids. Wonderful. But you don’t have to. Some brides recognize unique situations. For example, if guests make a trek in from out of town, it may be tough for them to find someone to come in for the weekend to watch the kid(s), especially if a mother is still nursing her baby. If you’re willing to include children for these reasons, you might want to make arrangements for a side room with childcare in case your guests would rather park their kids than tend to them during either the ceremony or reception. It is perfectly just, moral, and practical. You may have a friend/family member ask for an exception. If kids are welcome, you’ll simply address the invitation as Mr. and Mrs. John Smith & Family. This is key: know exactly what you want. Have a prepared response rehearsed and ready to go. If you really don’t want to mess with around with kids, only use the first two sentences above and lop off the section in brackets. You may have a better way to say it. If yes, think it through and be ready in case you’re put in the uncomfortable situation described above. Remember, this is YOUR wedding. Okay, are you ready to sketch out your North Carolina event? We’ve got the tools for our clients right here. Simply complete the contact form. We provide the logins for our clients which give you full access to all of our tools.